Jasmin Koschutnig (1988) is an Haarlem based artist. As an obsessive collector and reuser of waste materials she questions the relationship between humans and things. In her work she researches the flexibility of value; how it’s gained, lost and regained by objects. Jasmin studied Art History for one year at the University of Amsterdam, shortly after she started at the Rietveld Academy where she graduated (2012) in Textile Art and Design. 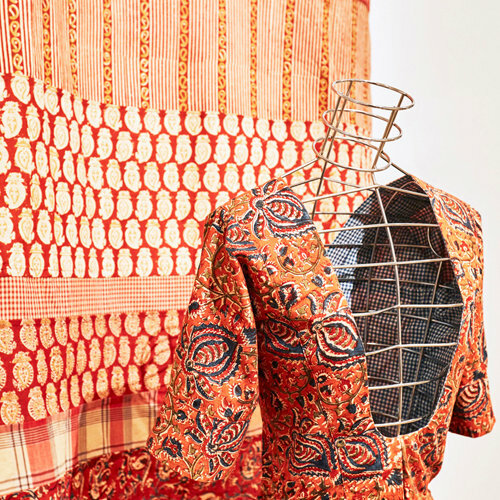 For Textiel Factorij she collaborated with the Indian master block-printer Srinivas Pitchuka. Jasmin used the printed textile leftovers of Srinivas’ workshop. 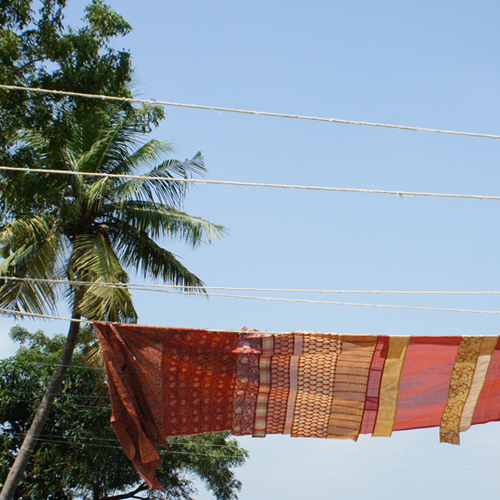 She made a Zeeland folded jacket of flowered chintz, that becomes a sari of colorful checkered Indian cotton. Not only do the remnants enjoy a second life, but they also represent a journey from India to the Netherlands.